Tswana is the language of many people with origins in several dozen chiefdoms in the northern Cape, western Transvaal, and Botswana; but there has never been one single Tswana kingdom. By the late 18th century the Tlhaping state had become an impressive Tswana kingdom based on a large capital town. The typical size of the Tswana kingdom was small. In this respect the Tswana kingdom differed widely from the military despotism of the Zulu and the ritual autocracy of the Lovedu. The financial base of the Tswana Kingdom was livestock keeping, small-scale agriculture, hunting, and gathering. The chiefs and nobles owned large cattle herds, and in addition, levied tributes from the Bayei, the Bakalanga, and the Kgalagadi. The most remarkable Tswana king of the 19th Century was Sechele (ruled 1829–92) of the Kwena around Molepolole. He allied himself with British traders and missionaries and was baptized by David Livingstone. The Tswana king used his new faith to consolidate power by disseminating the Word to the peripheries of the kingdom. While the missionaries' evaluation of Sechele's behavior in religious terms tended to disregard his position as a Tswana king, the focus of recent historians on Sechele's political motives has likewise produced an incomplete picture. 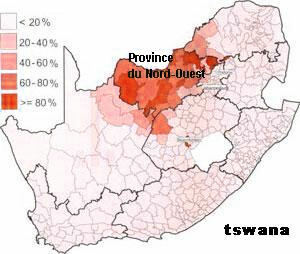 The conquest of the Northern Tswana is as much part of the story of the Transvaal as it is of Bechuanaland. In 1885, with Rhodes pulling the strings, the British government signed a treaty with the Tswana king, effectively driving a wedge between Boer and German territories with the Bechuanaland Protectorate. To drive a wedge through the middle of these territories, the British negotiated an alliance with Khama, a powerful Tswana king, and proclaimed as theirs the Protectorate of Bechuanaland - the forerunner of modern Botswana. For Khama, Christianity articulated a concern with power, as befitted a Tswana king. Nineteenth century SeNgwato SeTswana had little, if any, lexicon with which to denote a separation of "real" power from ritual and spiritual power. In 1876 the Tswana king, Khama, told England: "We are like money... they" [the Boers] "sell us and our children". At that time, Bechuanaland included the present-day Caprivi Strip. Due to the continued attacks of the Tswana King. Sekgoma, the British High Commissioner establishes the southern border of the western Caprivi Strip provisionally at Mohembo at the Okavango River (where the border still lies to the present. At the time of Botswana's independence the vast majority of the country's population was embraced by seven Tswana kingdoms (merafe, singl. morafe). After the independence, Xhosa, Sotho and some of the Tswana speakers, who had previously lived there, resisted Bophuthatswana citizenship as was their right under Status of Bophuthatswana Act of 1977. In June 1972 Bophuthatswana became the second homeland to be granted self-governing status. Transkei's announced "independence" on October 26, 1976, influenced Bophuthatswana to plan for a similar status the following year. On December 6, 1977, Bophuthatswana followed the example of Transkei in adopting independence in spite of previous declarations by Chief Minister Lucas Mangope that a solution to Bophuthatswana's fragmentation into seven parcels of land would first have to be found. Mangope justified the move by asserting that as a separate state Bophuthatswana would have more leverage in ending racial discrimination in South Africa. Its legislature was composed of forty-eight chiefs selected by Pretoria and twenty-four members elected by homeland voters. Although the Bophuthatswana cabinet adopted the position that citizenship should be optional for the 40 percent of the Tswana who live in White areas, Mangope failed to extract this key concession from Pretoria in intensive negotiations right to the eve of independence. Consequently the many thousands of Tswana permanently resident in White areas have forfeited their South African citizenship, and their offspring born after the date of separate status had not been assured of their legal rights to work and live in White areas. A further problem for Mangope was the large number of other Black Africans living within his territories — not only the Ndebele and Sotho people having historical claims to land but also vast numbers of squatters who commuted to work in the Pretoria region from adjacent areas of Bophuthatswana. South Africa had not fulfilled its commitment to resettle the people who were unwilling to take out Tswana citizenship. It was reported that by 1979 considerable numbers of squatters had applied for citizenship to escape police raids and legal harrassment. Chief Mangope won an overwhelming victory in the election of August 1977 shortly before independence, when his Bophuthatswana Democratic Party gained ninety of the ninety-six seats, which erre evenly divided between elected members and those appointed by chiefs. Questions, however, were raised about conduct of the election, and the turnout of 13 percent of eligible voters in the homeland did not demonstrate enthusiasm for severing legal ties with South Africa. Mangope's capitulation to Pretoria on the citizenship issue has been a source of resentment among the large Tswana population living in urban areas. One technique for excluding Blacks from the total estimated in the White areas has been to attach Black urban zones on the edge of cities to adjacent or nearby homelands. Invariably the Blacks living in such zones had been oriented to urban life and were dependent on the White-controlled urban centers for a livelihood just as the centers are dependent on Blacks for labor and as consumers. Thus one of the major Black areas attached to Durban has been added to KwaZulu and a similar area near Pretoria has been made part of Bophuthatswana, although its people are in all significant respects linked more closely to the city than to the homeland. During the period that the idea of separate development was being elaborated and the homelands established in law and in fact, aspects of apartheid in the White areas continued to be widely enforced. When the homeland governments were constituted, the White officials who formerly headed the administrative divisions were replaced by Black ministers, and the White officials become secretaries of departments within the territorial governments. When the homelands were declared independent, Black officials were normally elevated to replace the department secretaries, but the Whites often remain in an advisory capacity. Most senior administrative posts continued to be held by White civil servants and technicians on loan from the South African government — even after independence is attained. In 1979 three of twelve ministers in Bophuthatswana were White, and a South African army officer had been appointed minister of defense. South Africa regarded the small military forces organized in the three Black homelands it recognized as independent in the late 1970s as an integral part of an overall defense system. The 250-man Bophuthatswana Defence Force was trained and com- manded by personnel seconded from the SADF, and a retired South African officer served as the homeland's defense minister. The new states adopted security laws corresponding to those enforced in South Africa, and practices such as bannings and detentions without trial have persisted. Even Bophuthatswana, which has a bill of rights in its constitution, passed detention and internal security laws in 1979 enabling it to outlaw certain organizations and publications.